Fylde DFAS and the Friends of Lytham St Annes Art Collection are exploring the possibility of submitting a Heritage Lottery Bid to enable the cataloguing of the collection. This would only be possible with the help of volunteers working on a variety of roles, but mostly researching individual artworks within the collection and recording their findings. Volunteers will be offered training and guidelines. If you are interested in helping get this project off the ground then please contact Margaret Race, tel:01253 727268; email: g.race@virgin.net. The next opportunity to view works of art from the Lytham St. Annes Art Collection will be A Right To Play – Children in Art, which will celebrate 65 years of UNICEF. The exhibition will be held at the Fylde Gallery, Lytham, from 13th December 2012 to 27th January 2013. Lancashire Life magazine is planning to feature the Collection and the work of the Friends of the Lytham St Annes Art Collection in its December issue. The local Lytham St. Annes Express newspaper will also be running features about the exhibition during December, and the Friends are hoping that this publicity will attract new members and volunteers to help invigilate at exhibitions, and research artists and artworks held in the collection. Volunteers are required to invigilate the exhibition – please do get in touch with Margaret Race (tel: 01253 727268; email: g.race@virgin.net) if you can help out. The Friends of the Lytham St Annes Art Collection maintains a very attractive web site which tells you more about the collection and how you can help. There are over 200 works of art in the Collection, including large statues, figurines, scrolls, gifted and bequeathed ornaments and paintings in oil and watercolours. This Collection had its beginnings in 1925 when John Booth of the local grocery family donated a painting by Richard Ansdell RA called The Herd Lassie. This was the start of a steady stream of bequests and donations and in particular the involvement of Alderman James Dawson, that started in 1931 when he gifted Ansdell’s Partridge Shooting, and whose interest in building up the Collection led him to giving over 50 paintings and sculptures to the Borough for the enjoyment of local residents. Over the years there was considerable interest in continuing to collect works of art and with it a desire to build an art gallery in which to display them but unfortunately this never happened. In the late fifties and early sixties the then Lytham St Annes Borough Council appeared uninterested and some paintings were lost, some damaged and, it is feared, several remain unaccounted for. However, thanks to the tireless work of Margaret Race, Alderman Dawson’s granddaughter, who has campaigned to bring the Collection to the attention of the public, there is now a more enlightened attitude. Fylde Borough Council does now care for the Collection, there is regular conservation and curatorial advice from Lancashire County Museum Service and Booths built a beautiful Art Gallery at their new Lytham store specifically for the regular display of items from the Collection. There are now 28 paintings by Richard Ansdell in the Collection, the most significant collection of Ansdells anywhere. 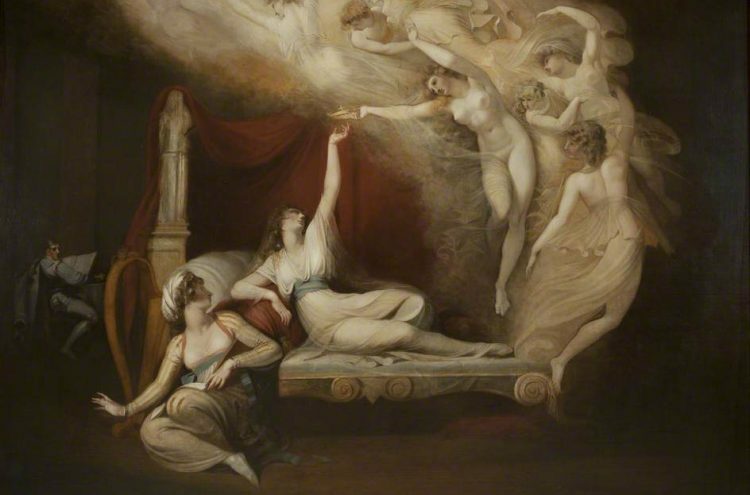 The most valuable painting and the star of the Collection is Henry Fuseli’s The Vision of Catherine of Aragon, first exhibited in 1781 and donated by Alderman Dawson in 1950. It had been on loan to the Collection for the previous 20 years when it was withdrawn by the family in 1950 to be sold. Not wanting to lose this wonderful picture, Alderman Dawson bought it and gave it back to the borough. Many paintings belonging to the Collection are still in storage and in need of expensive and skilled restoration work. The hope is that they will now slowly see the light of day and be exhibited, helped by money from the Conservation Fund set up by the Friends of the Lytham St Annes Art Collection.